The day may be coming close when robots support a comfortable living with security of the elders. Fujita Health University (Toyoake-shi, Aichi-ken) has just opened a filed laboratory of a small robots for the life support. It is planned to improve the robots integrating the voice of the elder who will have used the experimental ones. The rapid aging of the Japanese population is known to the world but not known so well that a quarter of the household is inhabited only those who are over 65 years old, of which a half is a single household. Hence robots are expected to support millions of the elders living alone. Japan has much to contribute to the world. Drawn upon its manufacturing capacity based on craftsmanship coupled with the aging of the population fastest in the world, a robot supporting the elders’ lives is an excellent example. The aging is a fact of life for everyone. I hope that Japan will find a brand new area of its competitiveness using the country’s resources, including the elders, who have not been valued in society. A subsidiary of Panasonic, ATOUN (Nara city), announced a plan to develop “the power assist suit” using the robot technology for workers engaged in decommissioning of the nuclear power generation. One may lift heavy things by small power when he/she wears it. Comments: It’s great that robot technologies may be used for the cloth. This idea may be used to support people with limited mobility, such as the aged and handicapped people. There was a massive collision of a car and sightseeing bus on the Tomei Expressway in Shinshiro-shi, Aichi on 10th. The operating company of the bus immediately grasped the state that a car jumped from the opposite lane and crashed against the bus. he bus was equipped with the Drive recorder which allows to watch driving video and driving record through a cell-phone network. While the number of foreign tourists is rapidly increasing in outstanding tourist city, Kyoto, its side effects are creating unexpected effects on everyday life of inhabitants. Public buses are always full and the number of illegal lodgings is increasing. Some started crying that the status has reached to the limit and that sightseeing is “pollution by tourism”. Comments: The same happened some 40 years ago by Japanese tourists in Kyoto. The city just can’t keep up with the rapid change. Production of the full-scale three-dimensional “digital map” necessary for the automatic driving of a car is getting momentum of production. 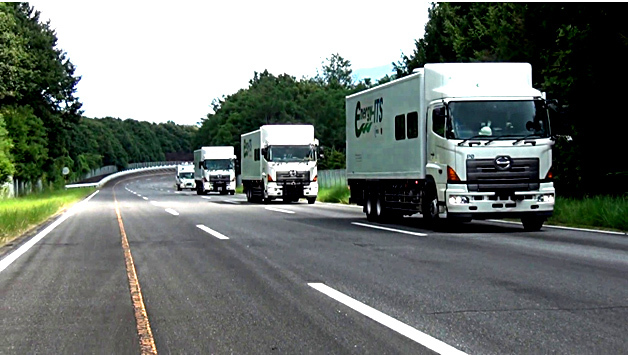 The Innovation Network Corporation of Japan, the fund established by the Government and Mitsubishi Electric announced that they would gather data of all the expressways and 30,000 kilos of exclusive motor ways in Japan by 2018. It is intended to create the infrastructure needed by he automatic driving and thus aim at leading international competition. Comments: Being instruments needed for enabling the automatic driving is developed. automatic driving may not be dream any more sooner than one would imagine. Hinomaru Transport (Tokyo), One of the largest taxi companies in Japan, and ZMP (Tokyo) of the automatic driving venture announced that they would work together to enable the practical use of the unmanned taxi. It is intended to operate an automatic driving taxi in limited areas in Tokyo by 2020, the year of Tokyo Olympic Games. Comments: Another marvelous development of automatic driving in Japan! Who will be clients of such taxi? — Maybe those who are curious. We need to learn my uhf through experience before taking benefits of technologies. 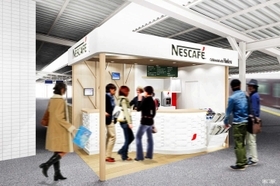 Nestlé Japan and Hanky Railway Corp. will build more “Nescafé stand”, which they originally built in the five stations of Hankyu line, including Tsukaguchi station, last year. The “Nescafé stand” sold more than 500,000 cups of coffee in the past five months, that had been expectations. The companies will build the stand in seven more stations from the end of May onwards. Comments: Why there were not many coffee stand in the commuter railway stations? It is a good marketing! Concerning the costs of Tokyo Olympic Games and Paralympics in 2020, it was revealed that Tokyo Metropolitan experimentally calculated the expense to be maximum 900 Billion yen out of the estimated total costs of 1,600 to 1,800 Billion yen. Tokyo Metropolitan expects in this calculation those local governments which do not have Olympic venues to bear 40 Billion yen as costs for guarding, etc. Comments: Who pays what is still controversial. Interested in our cross-cultural trainings, coaching and consulting to move forward business with Japan? Please click here. The workshop of “Cross-Cultural Understanding with Japan” was very resourceful, participated by a good-mixture of European and Japanese people. Culture is like an iceberg. Eighty percent of the iceberg is under the sea and we don’t see it. So called “typical” Japanese culture, such as sushi, high-tech instruments, kimono, bowing, are all the tip of iceberg supported by the rituals, geography, history, values, etc. hidden under the water. Major factors from which Japan is made — Geographic location and its historical consequences, climate, rice-growing culture and the peace that lasted for 700 years. A significant difference in the meaning of silence and space between Europe and Japan. It was proven that thirty-seconds’ silence is too long and uncomfortable for the Europeans, while nothing in particular for the Japanese. “Uchi- Soto“, the way the Japanese position you as a European business partner. It is worth noting that discussion by participants enriched the workshop, as well as eye-opening exercises. Working across cultures is not always easy but rewarding. Cultural diversity enables 1 + 1 be more than 3, 4 and more, and ultimately leads to the innovation. Last but not the least, many thanks must go to the Swiss-Japanese Chamber of Commerce (SJCC) which invited us for the workshop and Sunstar SA for the nice seminar room and warm reception! Mr. Han-iShinji, President of Shikoku Japan Railway Company (JR Shikoku, Takamatsu-shi), said, in response to the interview by Asahi News Paper, that he would release the income-expenditure data of each line that has not been published to an advisory panel of experts to be started after April. It is intended to share the knowledge with the panel of difficult status of the railway network in Shikoku Region while local population decreases, and thus to explore ways to maintain the network. Comments: It is surprising that such information has not been published so far. It is expected that publishing the deficit data would become the first step forward for transparency and public debate of problems of infrastructure. Professor Takanori Yoda (behavioral economics) of Kyoto University and his research team announced a result of their study that effects of a request for power saving to households to suppress the peak consumption volume of the electricity did not last long. The study found that a rate structure in which electricity rates during certain time zones are higher than a regular rate is more efficient than a power saving request. The study will be published in an economic journal of the US. Comments: It is interesting that on the contrary to consumers a power saving request has been proved to be efficient for business users. It is one of the mysteries of Japan that companies follow “Requests” by power companies even if there is no penalty and thy need the power supply to carry on working productively during hot and humid summer in Japan. Comments: The climate data has high value! 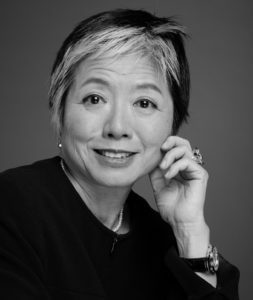 “Do not use the smartphone for child care for more than one hour and no use since at least one hour before sleeping time” — recommended by “Study group on the Internet use for young children (Chairperson, professor Akira Sakamoto of Ochanomizu Women’s University)”, which major Internet service providers, such as Yahoo, had established to study pros and cons of the “smartphone nursery”, by which parents let young children use smartphones as toys. Comments: Parens let babies use smartphones! This April is the first anniversary since the market liberalization of electricity sales for home. A number of regional consumers’ cooperatives in the Kansai region (the western region of Japan) enter the electricity-selling business. A business model is to procure the electricity from the power generation companies dealing with the velocity of the wind and photovoltaic power generation, and sell the power to Coop members. A home delivery network has become strength for the sales of the electricity. Comments: Consumers’ cooperatives work as a sales channel for newly entered power generators (which are usually much smaller than existing power companies). Ryosuke Ikeguchi, Associate Professor (orthopedics) of Kyoto University and his research team developed a technique to regenerate a damaged peripheral nerve by a tubular structure created out of patient’s own cells using “the Bio 3D printer” which could process a cell three-dimensionally. He succeeded in the experiment using the rat and published the results in PLOS ONE, a U.S. science online journal. The clinical trial is to start in 2020. Comments: It is worth paying attention that an early publication of this result is made possible because of the open access publishing business model, on which PLOS ONE is based. Fujitsu announced that the company would introduce “The telework system” that allows to work any place other than the office including home and on the road to all the employees from April. This applies to 35,000 employees except for those of the company’s group companies, becoming the case of a large-scale introduction in the country. By Telework, Fujitsu aims at reform go the way of working and accumulate know-how of distant working, that may in turn provide knowledge for future business. Comments: It’s a good idea to try a new way of working using IT starting with its own resources. Observing that there was no way to alleviate traffic accidents caused by driving of an elderly person, automobile constructors started enhancement of a car including “the prevention of false departure” for manufacturers to prevent an accident. The government also wants to make such a car widely available as a “a support car of careful driving” from the new fiscal year, starting today or 1st of March. The government wants to make such a car be widely available as “a car with careful driving support car” from the new year, too. That said there are many problems to really reduce the number of traffic accidents. A new action will start to farm mackerel using the fund raised by the cloud funding. Seabaya (Toyonaka, Osaka) that runs restaurants specialized in mackerel cooking in Osaka and Tokyo will tie up with Obama-shi (Fukui ken), which used to be a point of departure of the “Saba (mackerel) highway” connecting the city of origin of mackerel, Obama-shi , and place of consumption, Kyoto, in the past. This public-private partnership aims at bringing benefits to fishermen in Obama-shi. Comments: The success would largely depend on how much benefits planned by the partnership would attract the fund donors. Comments: This cooperation intends to capture and monetize out of collective intelligence of consumer preference regarding the fashion collected from videos for smart phones. According to the primary breaking news of the gross domestic product (GDP) of the fourth-quarter 2016 (October to December 2016) announced by the Cabinet Office, a real growth rate except the influence of the change of commodity prices increased by 0.2% as compared to the third quarter (July to September 2016). This growth is equivalent to the growth of 0.1 % when convert it into an annual growth. This figure resulted in the consecutive positive growth for four quarters or one year. Comments: The growth owns to trade surplus in 2016. Reducing growth of consumer consumption is still worrisome for the health of national economy. Panasonic and Tokyo Electric Power Company (TEPCO) plan to push forward a project to utilize a transformer in a box shape installed in cities to attach equipment of advertisement or information board. Using the space on the transformer, the companies plan to enable charging of an electronic signboard and vehicles. Panasonic showed a trial product in Tokyo on 13th. The service is planned to start in 2018. Comments: It is a part of IoT project promoted by Panasonic and TEPCO. Toshiba reported a loss of 712,500 million yen over the atomic energy business in the U.S. from the settlement of accounts (American accounting standards) for the period of April to December 2016, and announced the deficit prospect of USD 4.4 million as a net profit or loss (a deficit of the same period a year ago was USD 4.2 million). The company felt into exceeding liability at the end of December 2016. Toshiba will consider to raise a ratio of stocks to sell the new company of semiconductor business to be branched out from less than 20% to over 50% to avoid liabilities exceeding the assets at the end of FY 2016 or March. Comments: What to see in Toshiba’s saga is that what’s happening in the company is a consequence of lack of appropriate governance and mechanism to fix it that lasted for years till now. The debate on the cigarette is in fire in Nagatacho (the Japanese Diet). The regular smokers across the ruling and opposition parties resist against the proposed bill which is to introduce stronger measures against the passive smoking that the government is preparing taking into account the coming Tokyo Olympic Games and the Paralympics in 2020. The Japanese smoking habit is criticized as “the worst in the world”. Comments: It is a shame that members of the Diet put their ego forward while the public interests behind. “Future investment meeting” (chairperson, Prime Minister Shinzo Abe) , a mission of which is to formulate a growth strategy of the Government pulled together an implementation plan to partially realize the automatic driving of cars that does to require drivers in 2020. Recognizing that competition over the development of automatic driving becomes fierce in international markets, the Government intends to hold a superior position in the world by hurrying a proof experiment. Comments: The field experiment is a large step forward, even though many changes of road transportation are envisaged, such as driving regulation, highway structure, etc. Please click here for cultural training and become able to make progress with day-to-day business with Japan. Wish to contact us? Please click here. Comments: it is serious and the same may be true to the adults, including ourselves. Soon after having an exercise for ten minutes of the level of jogging, one’s short-term memory improves, according to a report of a study undertaken by a team of Tsukuba University, Japan, and the University of California, the US. The team found that results were better for those who had dome some exercise then whose who rested, in an experiment of the correctness of memory of an object seen in advance. The study team says that the function of the brain might be activated by the exercise. Comments: Good news for joggers and those who regularly do some exercise. Fujita Health University, Toray, NTT, NTT DOCOMO announced that they will start a demonstration experiment of “hitoe”, the cloth by which one could measure a heart rate merely by wearing it like the underwear. The cloth will be used to monitor a heart rate and various activities of a patient in a hospital. It is intended to allow efficient rehabilitation exercise to enable the early recovery, and also to utilize the cloth in the remote monitoring service after leaving the hospital. An expected timing of market release is after three years. Comments: Innovation take place where formerly completely different sectors and technologies meet. Thus another proof that diversity gives rise to innovation. Arriving at the office in the morning to find all the toilet rooms occupied! Dash to another floor to food them occupied again — To resolve such a problem development of the systems which allows us to check toilet rooms by PCs is making progress. A by-product of such system is that the collected data may be used for health check. This may signal the arrival of “The IoT (Internet of Toilet)”. Comments: Use of the data collected from the usage status of toilets is potentially interesting, though if and how much a company may collect employee’s health data is debatable. The number of applications for the recognition of refugee status in Japan was 10,901 in 2016 (3,315 increase compared to the previous year) , exceeding 10,000 for the first time, according to the preliminary figure released by the Ministry of Justice. On the other hand, only 28 people were recognized as refugees (one increase as compared to the number in 2015). In addition, the Ministry admitted the resident status to 97 people (increase by 18 year-on-year) because of “humanitarian consideration”. The government continues a severe attitude for recognition of refugee status. Comments: Severeness of the Japanese Government to the allocations of the refugee status has been one of the areas where Japan is behind the rich countries. My friend in Tokyo sent me a Valentine’s gift — KitKat Sushi. Though what I received was its online news (see a link below), hence nothing romantic, the news was sufficiently inspiring. Why? 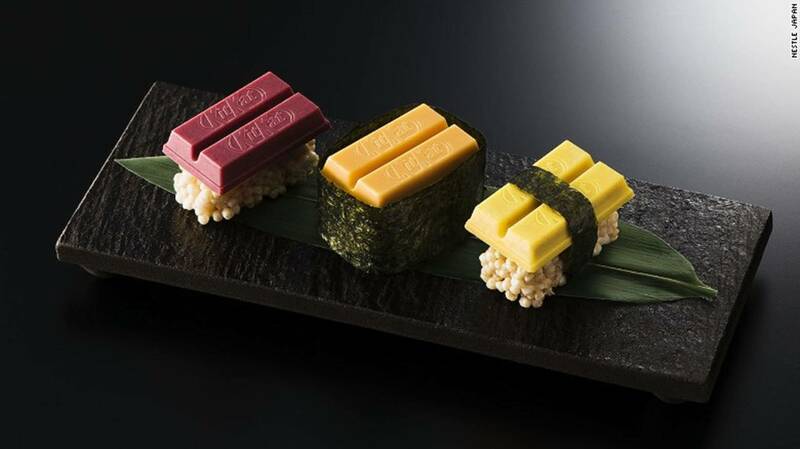 The KitKat Sushi typically demonstrates where innovation is born; Where two different things meet, there is a brand new idea. That is the reason why diversity is essential for innovation. I wish all your dream come true in 2017. The President Elect Mr. Trump criticized Toyota by his tweet for the company’s plan to build a new factory in Mexico, saying, “You should build it in the US, or otherwise pay a high import tax”. Having attacked US automobile major, Ford and other companies to stop building relocating factories outside the US, he shot an arrow of criticism to a Japanese company for the first time after the US presidential election. Comment: Government intervention in economic activities must be done with much care, as economic activities always run before the governments actions in the history. The government started examining ways to allow the Crown Prince to succeed to the throne to the new Emperor on January 1, 2019, and to commence the new imperial era name on the same day, following abdication of His Majesty the Emperor. It was judged that the change of an era on the New Year’s Day was desirable to minimize consequences on life of the public. If things go advance in line with the present plan, the present His Majesty will step down from the throne on December 31, 2018, and the Heisei will close a curtain on the 30th year. Comments: It should not be forgotten to discuss and establish a set of general rules for the emperor to step down from the throne. Otherwise, one might face the same issues for the next emperor, when the life time of the population is becoming longer and longer. Stock price of the Tokyo stock market decreased after an interval of two days due to a mass selling caused by disappointment after a press conference of the President elect, Mr. Trump. Comments: Would the stock exchange markets continue reaction sensitively to Mr. Trump for the coming four years? Toyobo, a textile major, and Union Tool, a vendor of medical equipment, announced that they had developed the underwear that alerted a driver when it detected that he/she was falling asleep and that the companies planned to put it on sale before the end of this year. The underwear is intended to prevent an accident by having drivers of bus or taxi wear. An increasing number of clothes-shaped wearable terminals are being developed as they may be worn more naturally than glasses type terminals. Comments: We’ll be wearing wearable devices in as it is literally meant.